Treats eczema and related dry skin conditions. Soothes dry and sensitive skin. Relieves itchy skin. Suitable for adults and children. Oilatum Shower Gel has been specially developed for the treatment of eczema and related dry skin conditions and the itch associated with dry skin. This wash works by forming a protective layer on the skin surface to reduce moisture loss. Oilatum Shower Gel moisturises, soothes and conditions the skin. This wash is suitable for daily use for both adults and children. To use, apply to wet skin and massage gently. Rinse briefly and lightly pat the skin dry. Oilatum Shower Gel is a medicine for eczema and related dry skin conditions. Contains light liquid paraffin. Always read the label. 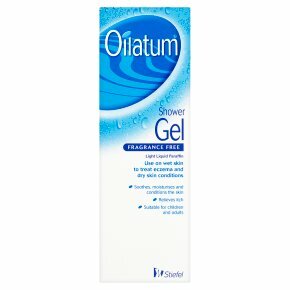 Use on wet skin to treat eczema and dry skin conditions Directions: Oilatum Shower Gel should always be used on wet skin. First shower or wash as usual, then apply the gel liberally to wet skin and massage gently. Rinse briefly and lightly pat dry. Please read the leaflet for further information. CAUTION:<br>Take care to avoid slipping.<br>This gel may make your shower or bath more slippery.<br><br>FOR EXTERNAL USE ONLY<br>KEEP OUT OF THE REACH AND SIGHT OF CHILDREN.